US$ 1840 / person ? 1 Arrival to Paro Arrival and accommodation in the hotel. If time permits you can test a bike and make ride around the valley. 2 Paro - Thimphu Ride 75 km, ➚400 m, ➘250 m. Today we will ride to Thimphu. See the ancient suspension bridge made of iron chains on the way. Afternoon sightseeing in the town and evening in leisure exploring the town's busy life. 3 Thimphu - Punakha Ride 70 km, ➚700 m, ➘1.800 m. After morning sightseeing we will start to Dochu-la pass (3.015 m). Great views of Himlayas in clear weather are stunning. Then we have a long descend to tropical Wangdue and Punakha valleys through mixed quickly changing forest. After reaching Lobesa (1.300 m) we will ride to Chimmi lhakhang, temple famously dedicated to saint who professed religion through drinking, singing and rampant sexual behaviour. Accommodation in hotel and rest. 4 Punakha - Gasa Ride 65 km, ➚1.200 m, ➘150 m. Today we will leave main highway and we will start ascending to the mountains, by recently built unpaved road. After reaching Gasa we can have a great leisure time in hot springs with their welcoming basins. 5 Gasa - Wangdue Ride 80 km, ➚500 m, ➘1.500 m. At the morning we will take a ride up to see the village and especially beautiful castle Gasa dzong, which hosts monastery and local administration. Then we will get back on the road to Punakha and we will continue even further to Wangdue with the ruins of the old castle burned to ash in 2012. 6 Wangdue - Phobjika Ride 70 km, ➚1.200 m, ➘400 m. Today we will get back to high altitude, to Phobjika valley in Black mountains. The road ascends gradually in many turns with beautiful views to the north. Finally we will reach the pass in 3.350 m and will descend to pristine glacial valley. Evening visit to local farmhouse and option to try hot stone bath. 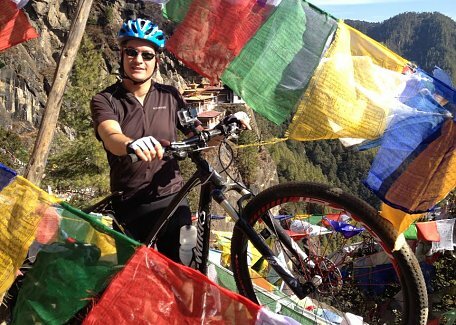 7 Phobjika - Thimphu (by car) Ride 20 km, ➚200 m, ➘200 m. Morning ride around the Phobjika valley. There is number of trails to try. For lunch we reach to Gangtey village and we will visit ancient and beautiful local temple. By afternoon we will switch to car to drive all the way back to Thimphu. 8 Thimphu - Paro (by car) Morning sightseeing in Thimphu and later drive to Paro. Visiti to National Museum and Rinpung dzong (castle). Afternoon and evening in leisure. 9 Paro Ride 30 km, ➚450 m, ➘400 m + 5 hours hike. Today we will ride to the castle ruins of Drukyel dzong. We will visit ancient Kyichu lhakhang temple on the way. After picnic lunch we will make a great hike to ubiquitous Tiger's Nest monastery overlooking the valley from hight cliff. Hike takes from 4 to 5 hours and it's one of the trip's highlights. 10 Departure Departure from Bhutan. Program subject to time of travel. Haa valley overnight (+1 day): Instead of going to Thimphu second day, you can make a diversion to Haa valley over the Chele-la pass (3.850 m), which is highest motorable pass in Bhutan. See day 3 and 4 in Western Bhutan Cycle Trip.